*Note that Video Wallpaper 0.1.1 fixes a bug where the video may not expand to the full size of your screen. Created by Eric Wong using code from www.codeproject.com. Should work on Windows XP, Vista - (32 and 64-bit). Please confirm. I have not thoroughly tested this on all systems. This program attempts to replicate Vista DreamScene without resorting to system hacks, malware, or botched graphics that can occur with some other programs. The program is essentially a type of VLC Player since it uses the plug-ins from VLC Player 0.8 to render the videos. Whatever you can do in VLC Player, you could probably program into Video Wallpaper. Video Wallpaper does not support .dream files but it will support any files that VLC Player can play. You do not have to have VLC player installed. However, this program differs from VLC Player in an important way. It doesn't botch system graphics and turn off Aero like it does on my 32-bit Vista Premium machine. -I need newer plug-ins from VLC Player that doesn't pause for 0.5 seconds after it finishes playing a video. I have seen a recently filed bug report for this so I am unsure when they will be able to fix it. -I need to make the desktop icons appear on top of the rendered video like VLC does. Right now, you are able to click on the desktop and icons normally. You just can't see them. -Eliminate the flicker that occurs when you press the "Show Desktop" icon in Vista and then take focus away from the desktop. The video stays put when you click "Show Desktop", its just that annoying flicker when you first click on another window. Unzip the files to the a directory of your choice. Click on the "Video Wallpaper" start icon. Your desktop will change to a video and you will see a new system tray icon. To change the video, stop, or exit, you should click on the system tray icon. I recommend you have some sort of dock application to show your desktop icons overtop of Video Wallpaper. 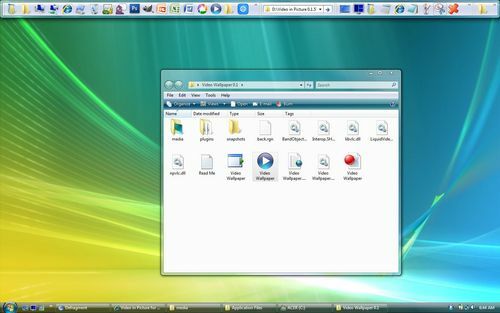 Windows XP and Vista actually have built in toolbars that can act like docks as shown in the screenshot below. To create a default Windows toolbar-dock, simply drag your "My Computer" or "Computer" icon off to one edge of the screen (excluding the edge where your taskbar is). The zip file comes with one DreamScene. To get more, you will have to search around. One site I recommend is http://www.dreamscene.org.